Our pellet grills are for control freaks—those who love precise numbers and tight temperature ranges. Our pellet grills are also for carefree cooks—those who love stepping away from the grill and relaxing until their food is ready. These two types of outdoor chefs may seem like polar opposites, but there is one thing on which they agree: it’s all about the taste. It is upon this uniting idea that we developed our Smart Smoke Technology. Now everyone can be happy, no matter what their cooking method. When you’re sitting down for a meal of smoked ribs, you don’t care if your pellet grill was at 220° F or 225°F; you just want to eat a dang good piece of meat. Many of our competitors love to brag about their breakthrough temperature control like it’s the greatest thing since man discovered fire. While a tight temperature range is important, it doesn’t give you the maximum smoky flavor you crave when you slow-smoke food. In order to keep a pellet grill within 5° of a target temperature, the pellet auger must feed a steady stream of pellets into the burn cup. There is a consistent fire, and therefore minimal smoke. What you’ll taste at the end of your cookout is a wood-fired flavor which, while tasty, isn’t the savory smokiness you hoped for. Now take our Smart Smoke Technology with the Lo Smoke and Hi Smoke settings. On these settings, our pellet grills fluctuate within 10° or 15° from the target temperature. This forces the auger to feed wood pellets into the burn cup less often and in greater quantities, leading to shorter burns and lots of smoke. 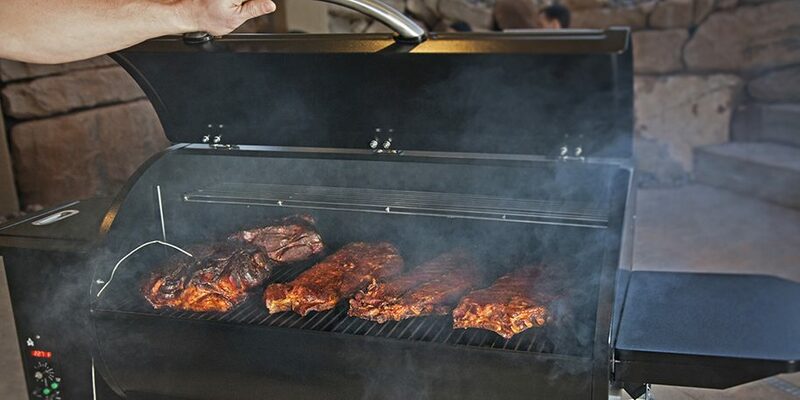 Our grills produce the optimal amount of smoke for maximum smoky flavor thanks to this technology. Try it out: the taste will speak for itself. If the idea of temperature fluctuation made your inner control freak a bit anxious, you can relax now. Our Smart Smoke Technology also offers the precision you need for baking, grilling, braising, and every other cooking job. We get it—with some foods, there’s no wiggle room with the temperature. That’s why we’ve included a variety of specific temperature settings from 175°F to 350°F and above. You can set the heat and count on your pellet grill to keep it. Enjoy food cooked to your liking and an excellent wood-fired flavor. So to both groups—the carefree cooks and the control freaks—we say cook on. Find your style of low-and-slow or careful-and-controlled. Embrace it. Whatever you prefer, the superior flavor of Smart Smoke Technology is for you.